One of the most challenging aspects of researching quilts is that, for many of them, there is no identifying information about the maker. Fortunately, this quilt top has a handwritten label stitched to it, which states “Made by Martha Brownlee born 1 Nov. 1801 Mother of Mary Brownlee Meloy.” Martha Brownlee was born to a Scottish immigrant father and Pennsylvania-born mother on November 1, 1801 in Washington County, Pennsylvania, a state that is rich in quilt history. The Brownlee family was prominent in law, politics, farming and the Presbyterian church. 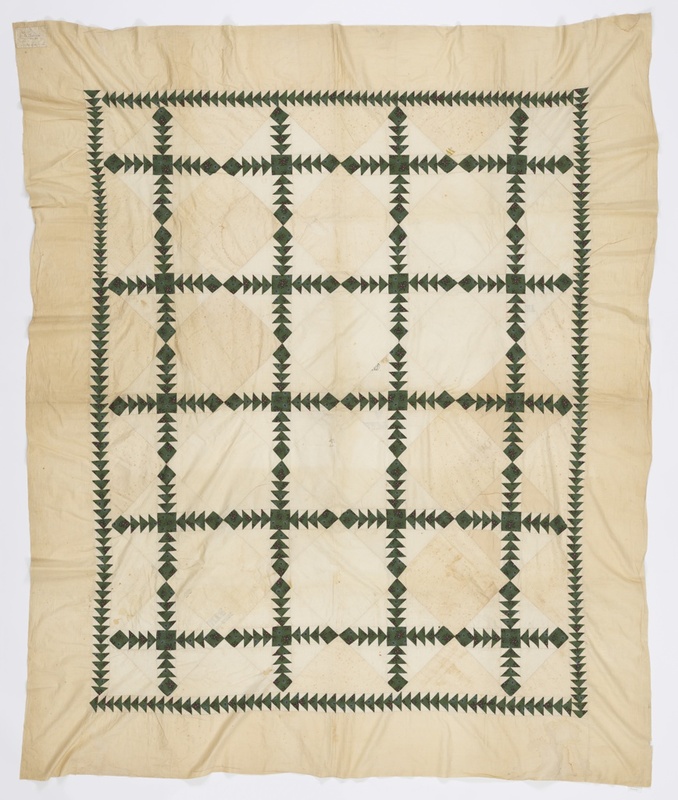 Martha Brownlee’s “Wild Goose Chase” quilt was either made for, or ended up in the possession of, her daughter Mary. Mary Brownlee (1840-1909) graduated from the Washington Seminary, a progressive Presbyterian seminary for women. In 1865, Mary Brownlee married the Rev. Dr. William T. Meloy, son of a Pennsylvania legislator, who became the head minister of First United Presbyterian Church in Chicago, a position he held for many years. Mary and William Meloy were active in the religious and social life of nineteenth-century Chicago while raising six children there. Both Mr. and Mrs. Meloy lived in Chicago until their deaths, but made annual trips to visit family in Pennsylvania. The name of the pattern is a little trickier – it is called either “Flying Geese” or “Wild Goose Chase,” depending which reference book or museum collection one turns to for pattern identification. “The pattern generally known as Wild Goose Chase has been an enduring and popular one for some two centuries, appearing in a variety of formats that include square blocks in both vertical and diagonal settings as well as in strips…The identifying characteristic of the Wild Goose Chase is a series of triangles that are stacked one above another, all pointing in one direction…Arranged in a strip, the repeated figures (the triangles) suggest the Vs and files of migrating birds that pass through the sky with the seasons.”  Examples of Wild Goose Chase in the collection of the International Quilt Study Center provide an excellent look at the creativity that quilters have expressed through their variations on the pattern. Hanson, Marin F. and Patricia Cox Crews. American Quilts in the Modern Age, 1870-1940 (Lincoln, NE: University of Nebraska Press), 204. Bowles, Hamish. Vogue, December 2008.